The Oxford Handbook series addresses a wide range of topics with contributions that both incorporate recent scholarship and offer pointed analyses of the authors’ own. The Oxford Handbook of the Baroque, coming out at the end of 2018, focuses on the baroque epoque. Associate Professor David Mayernik, in the School of Architecture Rome Program, was invited to contribute a chapter by the editor, John D. Lyons of UVa, a scholar of seventeenth-century French literature. Prof. Mayernik, what is your chapter “the Baroque City” about? The Baroque city was a theatrical space, from its built form to the ephemeral structures and processions that animated it. The city was also a microcosm, a world in miniature. Political means were used to represent civic harmony, the concordance of the civic and the celestial, and the city as the mirror of Justice; beauty wasn’t only an aesthetic thing, it was a sign of a harmonious society. The chapter I wrote focuses on several cities that are representative of some critical aspects of Baroque urbanism. Beginning in Rome, where many of the techniques of Baroque urban design were generated, I track their propagation to Paris and across France, to Germany, and finally to Amsterdam. I try to paint a picture that depicts those characteristics of the Baroque city that made it both unique and influential. How did you decide what to feature in the chapter and how did you select the areas on which you wanted to focus? I was given free rein to address the topic as I saw fit, and it fit nicely with my ongoing interest in urban form and meaning (as I dealt with it in my edX course, “The Meaning of Rome”). My research travel was generously supported by a Nanovic travel grant, and in May of last year I visited Bordeaux (FR), Neuf-Brisach (FR), Karlsruhe (GE), Ludwigsburg (GE), and Amsterdam (NL). Rome, of course, I know well, and I’ve been lucky enough to have visited Paris often and lived there in the summer of 1993 on the Gabriel Prize. Which city did most inspire your work? In the chapter, everything emanates from Rome, of course! And it was fun for me to share my research on Paris with the students we took to Paris this past spring on our first trip there in decades. 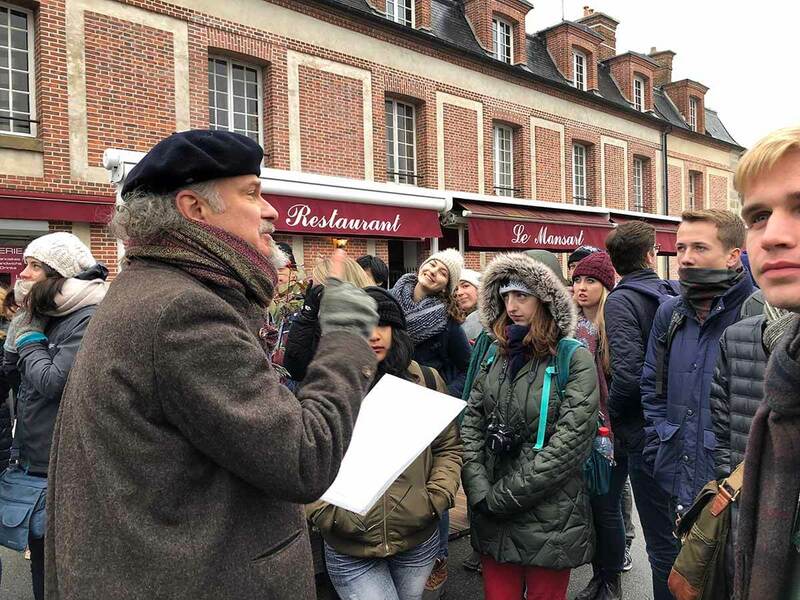 The Rome-Paris link is a powerful one in the Baroque, and is really the raison-d’être of this new field trip destination for the School of Architecture. What is the rest of the Oxford Handbook of the Baroque about, and when will it be published? David Mayernik is a practicing architect and artist, and Associate Professor in the School of Architecture at the University of Notre Dame Rome Program. He is a Fellow of the American Academy in Rome and the RSA, and a winner of the Gabriel Prize. The author of “Timeless Cities” (Basic Books) and “The Challenge of Emulation in Art and Architecture” (Routledge), he has written extensively on urban history and theory. For several seasons he designed and painted stage sets for the Haymarket Opera company of Chicago’s historically-informed performances of Baroque operas. Originally published by Costanza Montanari at rome.nd.edu on September 05, 2018.